Writing advice: NaNoWriMo Day #9 – Go ask Alisa – DIY capsule wardrobe one stitch at a time! Couple of days ago I found myself sitting by the swimming pool and grasping for words. Where to start, when I am already 15,000 words behind? My momma told me never to give up, so I did not. Instead I used some outrageous creativity. For starters: I tucked away my computer. Then I grabbed some blank pages, colored pens, timer and headed to a quite place. After two hours of intensive writing I felt like the Queen of the World! First – I wrote in handwriting. I imagined that I was about to write a letter and that I was running out of time. No one in the world wants to share a burden of re-writing the letter, so I chose to be a talented letter writer rather than a poor scribbler! 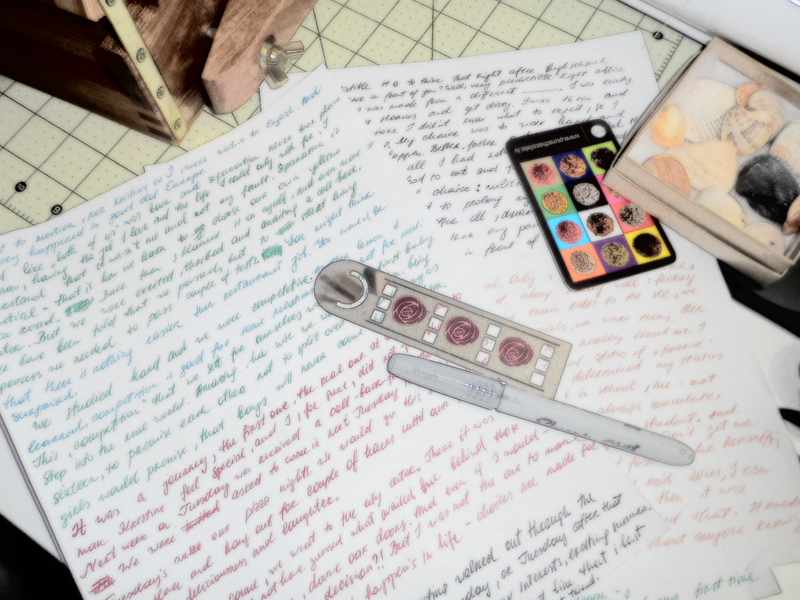 Second – I used colored pens to separate different parts of my novel and focus myself on a new paragraph or chapter. Color also helped me to set appropriate mood for character description (red), weather/nature (green), beginning and culmination (black). Third – I used timer. A lot of us, especially those of you, who are regulars at NaNoWriMo write-ins, will know this as Word Wars. You set the timer, zip your mouth and go! I choose to write carefully, I like to think my writing through. One way or another – timer helps! After all, I am pleased with the result – 3,000 quality words in 2 hours. How do you get your writing done? Share! I think this advice works for NaBloPoMo as well. I know I’ve had quite a few moments where I was at a loss for words. I wrote posts about music. If that didn’t work, I just didn’t post. I can’t always force it no matter how much I want to. Good for you Alisa! If I wrote in handwriting, I’d never be able to figure out what I wrote later. My writing as gotten so terrible ever since I’ve been using a computer.